Like the authors and artists we represent, Adams Literary is committed to excellence. Adams Literary is a place where authors, artists, editors and publishers come together to create outstanding books for the most important audience: children of all ages. 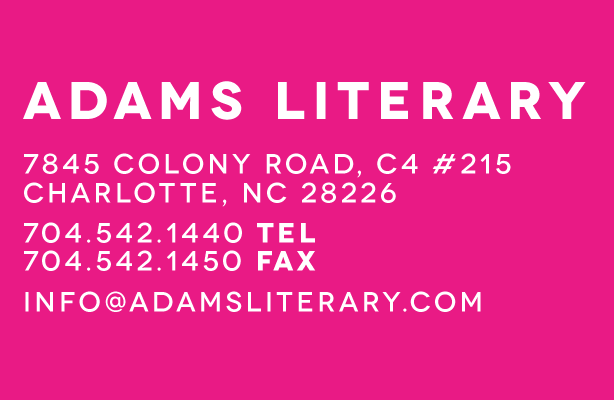 Adams Literary is a full-service, boutique literary agency exclusively representing children's and young adult authors and artists. Founded by Tracey and Josh Adams, Adams Literary prides itself on nurturing the creativity of its clients and maintaining close relationships with editors and publishers in New York City and around the world. Our philosophy is that we represent authors and artists, not books. As such, we don't work on a book-by-book or term basis, like some agencies do. Instead, we work closely with our clients to intelligently manage the entirety of their children's publishing careers. We take a long-term view of the market, of our jobs—and of launching and building our clients' careers. Drawing upon our editorial expertise, knowledge of the industry, and extensive experience in contract negotiations, we provide editorial judgment and input, marketing consultation, rights management and long-term career planning and advice. In addition to placing and negotiating North American publishing rights, we actively market and negotiate film, UK, translation, audio, merchandising and other subsidiary rights on behalf of our clients. While we like to think of ourselves as matchmakers—connecting authors and artists with editors and publishers, and young readers with unforgettable books—our first priority is to ensure our clients have the peace of mind to concentrate on their characters, not their contracts. At Adams Literary, we like to think differently—and creatively—in addressing the issues that inevitably come up in publishing. While we have a healthy respect for publishing traditions, we also like to challenge the status quo—for the better. We don't have a cookie-cutter approach to what we do, but custom-tailor our submission, negotiation and publishing strategies to each client's needs and goals. From our base in Charlotte, NC—where we moved after more than a decade in New York City—we work collaboratively with our clients around the world. We know we're in this together, which is why we take a team-oriented, collaborative and communicative approach—amongst ourselves, and with our clients. Our aim is not to be the biggest, but to be the best. Because we know our clients deserve no less.